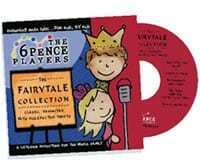 My children love to listen to audio CD’s and 6 Pence Productions has really elevated audio storytelling to new levels with The Fairytale Collection and Princess Reform School. What makes these two audio CD’s so special? In a creative and refreshing twist these audio CD’s are made “for kids by kids” as the performers are all aged 5 to 17. I am frankly amazed at how talented these young performers are and I was just as captivated by these stories as my children. In fact, when my children realized that these performers were children they got really excited and sat wide eyed and quiet throughout the entire CD. The Fairytale Collection includes our personal favorite The Three Billy Goats Gruff as well as Cinderella and Friends, The Emperor’s New Clothes, The Three Little Pigs Meet the Big Bad Wolves and The Princess and The Pea. Each story runs approximately 8-14 minutes which is perfect to keep the attention of young children. In fact, my kids enjoyed the stories so much that they have requested to listen to the CD several times and have actually started to act it out together too. I really enjoy watching their imaginations soar……. Princess Reform School is a delightful story that promotes and celebrates a young girl’s self esteem while including princesses, toads, castles and even a dragon to bring the story to life. I originally thought that this would only appeal to my four year old daughter but both of my boys enjoyed it equally and request it too. The Fairytale Collection and Princess Reform School have been invaluable on long travel rides and during our quiet time as we wind down for the evening. It is obvious that the young performers are passionate about these productions as evidenced by the excellent quality of these audio CD’s. I think these would make really creative gift ideas especially for children who enjoy drama, the theatre or simply appreciate a great story. 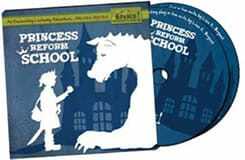 You are invited to visit 6 Pence Productions to listen to a sample of both The Fairytale Collection and Princess Reform School. You can also purchase your own copy of each of these CD’s on their website or Amazon.com. Reviews & Blogging 101 | How Do You Handle Negative Reviews? I like that you can download coloring pages & paper stage puppets from their website! I joined the 6 Pence Productions Mailing List. Thanks for the great giveaway! What a cool idea! It’s like audiobooks for kids by kids! No wonder kids are more likely to listen if they’re listening to other kids tell a story! 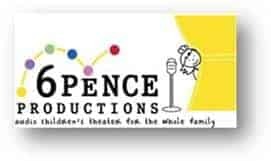 Joined the 6 Pence Productions mailing list. Already FB fan (Laura Grassie Henderson). My favorite item from your store is the HearthSoft Protective Hearth Cover.